Six-year-old Ryan was asleep in bed the morning after Christmas 1960 when he was awakened with news that their mom had died. “Mommy!” he cried and rubbed his eyes. There would be no more sounds of high soprano echoing across their home and neighborhood. “Mommy!” he cried some more. She would no longer sing “Me Gustan Todas” while he accompanied on the piano. The music stopped in T-30, Area 1, UP Diliman where they lived. But at six years old, it was already evident that Cipriano Raymundo, or Ryan Cayabyab, was a musical prodigy. “He has exceptional traits in musicality,” a music student and future dean of a music conservatory wrote in her case study about three-year-old Ryan. She watched as the boy sat tall on a bench and played tune after tune, stretching his little fingers to hit the right keys. “No, that is not correct. Do it again!” his big sister Melody called out from the yard or her room whenever he missed a note on the piano. Being older, Melody had already taken formal lessons and was happy to take on the teacher role. Obligingly, her student spent hours playing and practicing until he got the pieces right and his tender fingers hurt. He was so good at it that you’d think the road was paved for his future in piano. But music and money were strange bedfellows. Parents never want to see their children go hungry and music seems to draw a straight line to poverty. So ingrained was that belief that his mom, Celerina, who loved to sing, was also not allowed by her parents to study. Fortunately, she knew enough to trust she had a good voice so she entered an amateur singing competition. There she was “discovered” by one of the judges and given a music scholarship. Eventually she became a voice professor at UP and a renowned opera singer. Ryan must have taken up after her. He kept studying, and by age eight or nine he read music sheets and could sight read, meaning, he could play music he had never heard before. He began playing in the UP Chapel and people heard mass just to listen. They were awestruck. Who was this kid who could play anything on the piano? His repertoire was not limited to classics, hymns and ballads. His brother Bert had a rock band in Pangasinan. One summer at a town fiesta the band surprised the excited crowd by calling young Ryan to the stage. The boy hit the keyboard, did the Zombies’ “Summertime” and by the time he got midway with a strong solo, the crowd had gone wild! Today, Ryan is best known as a composer, having written hundreds, if not thousands of tunes, in his career. It all started with a single song, one that he thinks he wrote in first year high school. Entitled “Dirge,” he gave life to a poem his schoolmate had written. “Dirge” means “a mournful song for the dead.” Could it have been a cry for his mom? Celerina’s death caused more than heartbreak and disbelief. 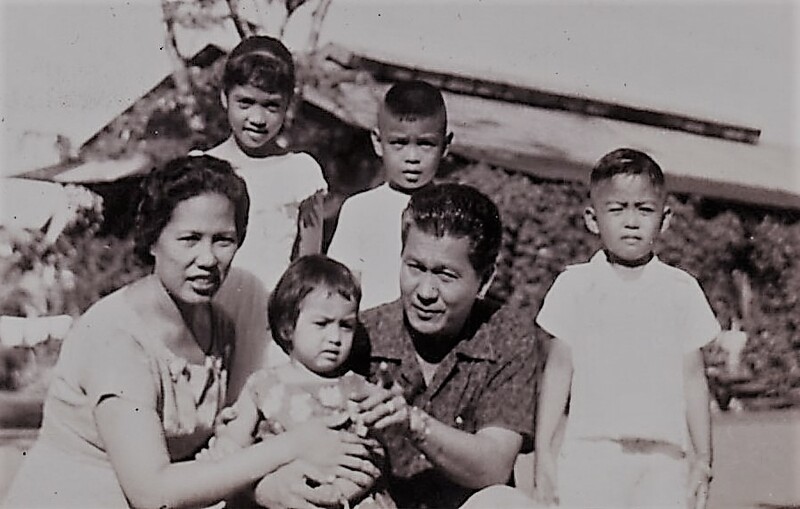 Aside from leaving four children without motherly love, she left her handsome 44-year-old husband, Alberto, to provide for all four, their house help named Aling Edad and a dog named Brownie, all with his meager income as a government auditor. Those were trying times. Ryan recalls that they sometimes ate not so palatable fried green or unripe papayas dipped in sugar or bagoong for dinner. That’s it. One day when he was eight he was riding his kick scooter when one of the equally young Daza girls (Nora) grabbed the handle of his ride. He fell and broke a forearm. He screamed and cried like mad, causing Aling Edad to run and take him to the nearby infirmary. Unfortunately, the job was too big for the clinic to handle and they were taken by ambulance to the National Orthopedic Hospital in Mandaluyong. The public hospital put a cast on the boy’s arm and told them to go home. But how? They had no money. Ingenious Aling Edad stopped the first bus, pointed to the poor kid in a cast and made a deal with the conductor that they would remain standing in the bus if they could have a free ride home. It worked. That incident was pretty significant not only in humbling the boy and his yaya, but also in saving Ryan’s forearm. Permanent injury could have put a halt to his piano ambitions. 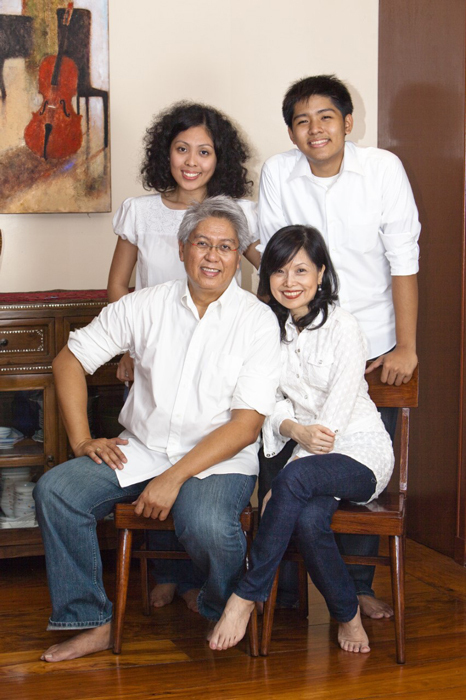 Their mother’s death also meant there was no longer a UP employee in the Cayabyab family. Rules were rules. They had to leave their beloved sawali or bamboo home in Area 1. It took a while, but soon the brand new three-bedroom, one-bath bungalow their father had built on 7 Mahinhin Street, UP Village was completed. They could now leave. It was a sad, sad move for the Cayabyab siblings who so loved the neighborhood that was abundant with musical talents, intellects and other legends. Of course they were unaware that one of them would someday become one of the biggest legends of all. Ryan resolved to find work. He was tired of not having money. He could not join friends in their escapades and they had started not to ask. Or maybe he had had enough of fried green papayas. He then thought to venture outside of music. The YMCA had a call for entries in a painting competition. Unfazed, he wrapped his Mankind painting in newspaper, rode to Arroceros Street and at last he could submit his entry. But when he uncovered his canvas he found that the newspaper he used for wrapping had stuck to his still-wet painting. Oh no! Pieces of newspaper were not a part of his Mankind scene! No, he did not give up. He carefully peeled every last shred of paper from the surface, crossed his fingers, held his breath and turned the canvas over to the competition agents. A week later he received a telegram from YMCA. “You have won!” it stated. Actually, it said he had won third place and a prize of P50. Boy oh boy. Ryan, the painter, was ecstatic! With his prize he bought two cans of corned beef, underwear, some art materials and the remaining P20 he gave to his father. Again, in high school, he tried to earn a few bucks by playing piano in the Rhapsody Music House near Raon Street. This time the stars were all lined up and twinkling. He was playing one day when his first cousin Francia Carreon chanced by. She stopped, listened and said “He’s pretty good!” Well, Francia had links to the Development Bank of the Philippines (DBP) and told him to audition for their choral group. He did. He was hired as pianist/accompanist, but only after again lying about his age. As a lanky six-footer, the 15-year-old easily passed for 18. He was floored by his luck. The job was most enjoyable and it paid well too. He was now able to help with the family income. His first salary was P200. Then it went up to P250 and in less than a year the hardworking teenager’s remuneration had doubled to P400 a month. So large was the amount that when he graduated and went to college, he told his dad he would pay his own tuition fee. Daddy was happy but nonetheless asked that he keep his promise to his mom to stay away from music. Thus, instead of going after his great love, he enrolled in the UP College of Business Administration. Meanwhile, work with the DBP Choral Ensemble made great strides. They wowed audiences everywhere. Then-Senator Salvador Laurel took interest in his extraordinary talent and offered to pay his way through any college or university to pursue an education in music. In 1973 Ryan made the switch from business administration and never looked back. Five years later he won both the Metropop Song Festival and the Seoul Song Festival for his composition that became the anthem of the Original Pilipino Music (OPM) movement -- “Kay Ganda ng Ating Musika.” The same year he received one of the “Ten Outstanding Young Men” awards for his contribution to Filipino music. 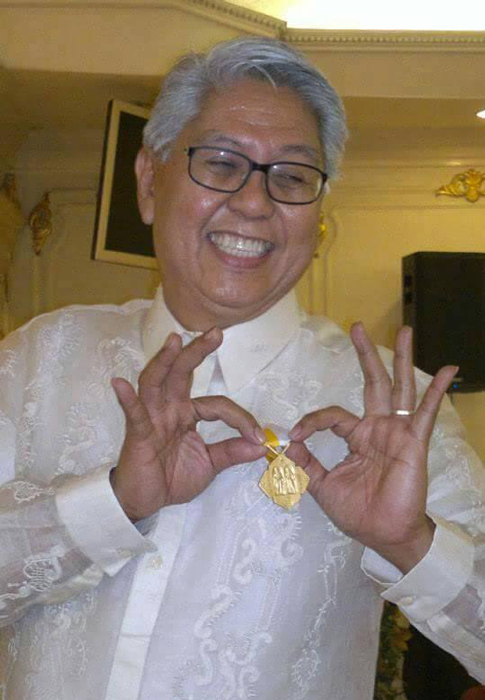 Already, Ryan Cayabyab had become a household name across the country. In 1985, the music professor married one of the brightest students in his class, a pretty Kapampangan named Emmy Punsalan. Aside from running the Ryan Cayabyab Music School, Emmy is said to be the force that keeps her husband ‘s feet planted on the ground. They have two children—Krina and Toma—both musical performers in their own right. The two hold the torch that will keep the Cayabyab music playing for at least another generation. “No, you may not study music,” his mom’s parents had ruled two generations ago. “Do not be like the starving musicians of Raon,” his own mom later warned. But Ryan keeps defying the odds. His “exceptional musicality” and drive have long surpassed luck, and he is no longer afraid for himself or his family. They’re going to be all right. Ironically, with music, he never has to eat fried green papayas again.